The long-serving textbook, which wrapped up four decades of teaching at Jefferson Middle School this past June. 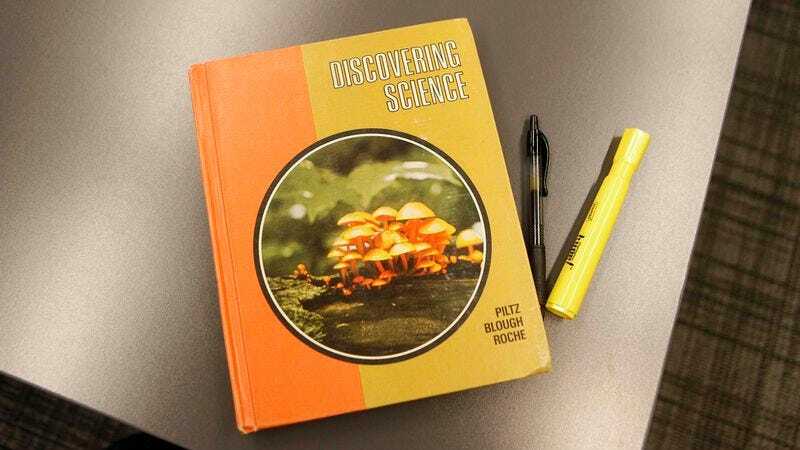 PITTSBURGH—Bringing to a close what former students and administrators are calling an “immensely impressive tenure,” longtime science textbook Discovering Science retired this week following 40 years in the public school system. The 270-page illustrated text, which began its term at Jefferson Middle School in 1975 after coming to Pittsburgh straight from the Prentice Hall publishing house in New Jersey, departs its position after spending countless hours in the classroom where it taught multiple generations of local seventh- and eighth-graders. According to Sheerer, the textbook has guided hundreds of classes of 12- and 13-year-olds through a broad range of topics, including NASA’s Gemini and Apollo programs, the 1971 San Fernando earthquake, and the expected effects of passing the Endangered Species Act. “I still remember everything it taught us on the solar system’s nine planets,” Kolus added. In addition to teaching science courses throughout the academic year, sources said Discovering Science often spent afternoons helping students with homework and test preparation. Administrators confirmed that the book would also typically stay on well past June to teach summer school classes and even taught honors science from 1991 to 2000. In a testament to its unfailing commitment to education, Sheerer said the textbook continued to teach students about physics, geology, and the enormous promise of microprocessor technology all the way up through its final few months in the classroom.